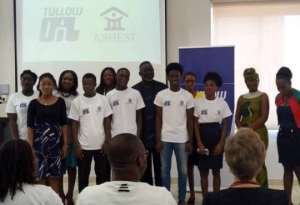 Tullow Ghana Limited has launched a scholarship scheme to support brilliant but needy Engineering students of Ashesi University College. Five students of the University benefited from the package dubbed: 'Tullow Ashesi Engineering Scholarship Scheme', and will enjoy free tuition, housing, meals, and health insurance. The scholarship scheme was set up to build capacities of students through Science, Technology, Engineering and Mathematics (STEM) education in order to produce graduates who would use their skills to help in the development of Ghana. Madam Lina Sowah, the Senior Geologist at Tullow Ghana Limited, speaking at the launch said the scheme was expected to expand in the coming years to cover at ten undergraduate students offering courses in Engineering at University. She said the scholarship scheme was one of the many strategies Tullow Ghana had initiated in the promotion of STEM education in the country. Madan Sowah stressed that since 2010, Tullow Ghana had supported education, and scholarship as part of its tenet of shared prosperity to grow and develop the capacity of Ghanaian students in various fields of study. She stressed that as part of efforts to drive Tullow's STEM initiative outlined in its Socio-Economic Investment Strategy covering the period 2016-2020, the oil exploration company in 2017, decided to focus more on STEM education, hence the launch of the 'Tullow Ashesi Engineering Scholarship Scheme'. 'This has provided access and opportunity for us to support, preparing the next generation of students for a technology driven society in which we find ourselves, particularly for the jobs here in Ghana and also in the oil and gas industry which is our core business,' she added. She echoed Tullow's commitment toward creating 'shared-prosperity' of leaving a legacy of lasting sustainable social and economic benefit in its host countries. Madam Sowah said the company had positioned itself toward capacity building through STEM education and development, to prepare the youth to act as a link between STEM education and a direct positive impact for the Ghanaian economy. She posited that the company would strengthen the local economy by building up the private sector and expanding growth through local economic activities and also in investing in shared infrastructure and logistics. She urged the beneficiaries to work hard in their various courses to encourage others to develop an interest in the study of Science and Engineering courses.